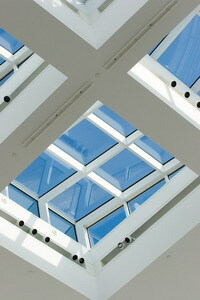 Bubble sky lights are probably the most common form of skylights found in residential and commercial buildings. Using 1980's technology, bubble skylights are usually made from acrylic or polycarbonate, and have an aluminum frame with a thermal barrier. 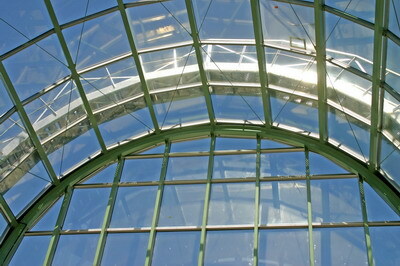 However, bubble skylights that are made from glass are the most withstanding against the elements and the test of time. Bubble skylights can be shaped to many desired curbs, yet are most frequently shaped with a 9 inch high curb. Also, bubble skylights can be installed with only one bubble, or a cluster of many, such as a group of four. As the name suggests, skylight bubbles are curved in shape, which allows for excellent water run off, and light gathering from every angle. If made from plastic, the curving of the plastic sheet dramatically increases its strength and helps to eliminate the expansion and contraction that is known to destroy skylights over time. Skylight bubbles are generally light in weight, making their installation quick and easy. Plus, bubble skylights are significantly cheaper than other forms of skylight, ranging from about $20 for a 10'' by 10'' sized skylight bubble, to $181 for a 45'' by 45'' skylight bubble. However, because of their ability to gather light room many directions, bubble skylights are prone to increase the level of heat in a room, and as a result, cause the water vapor in the air to rapidly condense. Our pre-screened roofers can install a bubble skylight for you quickly and efficiently, with a unique bubble sky light ventilation system, which can prevent such problems from occurring. 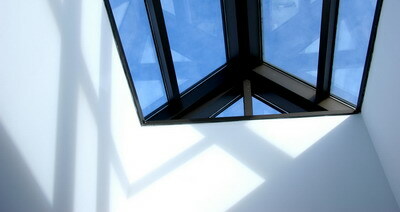 For all bubble skylight services and advice, contact your nearest Roof 101 branch today.